Ride and Read! NEWS by Madness Photography - Onno "Berserk" Wieringa: NEW FRED KODLIN RADICAL BAGGER PRESENTATION! Welcome to the unveiling of a new and radical Fred Kodlin Custombike at MOTOR BIKE EXPO 2019! Electrifying Kodlin Custom Bagger premiere at MOTOR BIKE EXPO! For the 11th Edition of MOTOR BIKE EXPO 2019 in Verona/Italy, Master Customizer Fred Kodlin and Len Kodlin will unveil their latest custombike-creation: Don’t miss to visit the Kodlin Display (Hall 1, booth 7D) at Verona ! Always a spectacular display at MOTOR BIKE EXPO, presenting radical one-off custom motorcycles, Fred and Len Kodlin will PREMIERE a radical new Bagger-style Kodlin custom at this years MOTOR BIKE EXPO. Details are, as always, “Top Secret” as the bike is being still prepared and assembled, but again is expected to be radical and revolutionary! With the 2014 fire-spitting MBE display of the breath-taking "Outtalimit", the stunning 2018 “KR 300” presentation, the Kodlin team has made its mark at MOTOR BIKE EXPO – since then, numerous extremebikes have been introduced and handed over to their owners, his latest Speed-Bagger innovation, the “Race Glide” series with extreme performing 124 Cubic Inch “Milwaukee Eight” equipped Road Glides! One of the most exiting bike-premieres of 2019 (Image: January 2017 at MOTOR BIKE EXPO Verona Fred Kodlin's Custom Chrome Europe "Ride Unrivalled" Sportster "Sportlin" was introduced), Fred and Len Kodlin will premiere a radical new Bagger concept at MOTOR BIKE EXPO 2019! 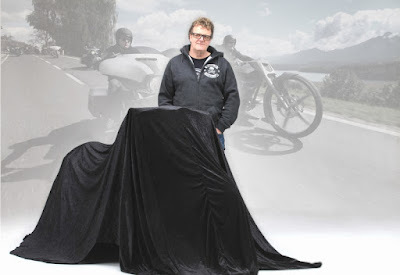 Fred and Len Kodlin's latest radical ride will “electrify” the custom-world: "Latest state-of-the-art technology and detailed refined styling", are the trademarks of Germany's only "Master Customizer", working from Borken/Hessen/Germany. Again, Fred, son Len and their team have worked massive overtime to create a ground braking radical custombike, this time premiering at MOTOR BIKE EXPO in Verona! The Kodlin Murdercycles display can be found in Hall 1, booth 7D. Fred & Len Kodlin will welcome you and will be available to answer your Questions!